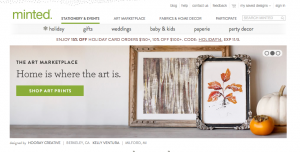 The design of the Minted Blog fits with its overall brand. I’m surprised I haven’t heard of Minted before. I’m sure if I asked my wife right now (she’s on a work call) that she would know. I’ve been looking around the Minted site a little while and have been impressed. You definitely get a certain kind of feeling as you browse. I do have to say I’m a little out of my element on the site. I’m not sure if I would be the exact target customer on the site, but I do have interest in creative arts, art and cool and unique stationary. But today I’m going to look at the Minted Blog, which is called Julep. I’m not a big liquor drinker so I had to look up the Mint Julep on Google. Now I think it’s clever. So I’m out of my element on a bit, but I think that might provide a unique perspective on the blog. Here are some interesting things about the Minted Blog, Julep. As I’m writing this post it’s right around Halloween. And we have Thanksgiving and Christmas coming up. Today it seems there is always something going on each month with at least one or two big events. Just about any blog including business blogs can use these current events in blog posts. Minted has a ton of posts that relate to Halloween. People are searching for information about Halloween. Minted is finding the intersection of their industry and Halloween. You’ll find posts about Halloween recipes, drinks and more. You’ll find DIY costume ideas and party ideas. There is a ton of information. You can probably do the same with your blog. Find that intersection where your industry meets a current event. But always make sure the post provides something actionable or interesting for your reader. Minted does that with the DIY tips and the ideas. One of the most recent posts on the Minted Blog is one on a wedding. From what I gather it’s an example of a couple that used Minted to order something for their wedding. Now they’re featured on the blog. It’s a cool idea because Minted gets to showcase the wedding and the bride and groom while also promoting the marketplace and the store. But that’s not what I love the most. This is part of the Minted Real Wedding Series. I’ve been trying to think about series more. In fact, you’re reading one post from the GBW series on blog analysis. It’s actually an old school newspaper or magazine strategy. When you write posts that fall into a series you get people coming back for more. Those that really love weddings will come back each week or however often these are posted to check for the new posts. I checked out the archive page on the blog. It was pleasing to see that the blog has been active since 2009. Not only that, but Minted has had at least one blog post (and usually many more) each month since 2009. That’s not an easy task. What you’ll often see with business blogs is that they’ll get started and after a few months there won’t be any more posts. In fact, I first saw the archive for Minted in the sidebar and I thought it only went back a couple months. It’s usually the 3-6 month timeframe when businesses give up on a blog. And that’s the time (about 6-12 months or a little more) when you start getting traction. Minted obviously created a plan for their blog and they’ve stuck with it. I’m sure the traffic hasn’t always been there, but they stuck with it and now it seems to be an important part of the business model. You need to have faith with your blog’s design. The faith you need is that once a new visitor is on your blog that they’ll find their way to the main pages on your site without being bombarded by annoying pop-ups and ads and calls to action. I think the design of the Minted Blog is great. Could they get more traffic if they had an in-your-face design calling visitors to the stores? Probably, but that’s short-term thinking. With a blog, you need to put the focus on the content in the post. Let people consume what they came to consume. You can add subtle links to your homepage and to other pages. If you do a good job with the content in the post they’ll want to look for more about you on their own. That’s how business blogging works. Two popular types of blog posts are lists and features. A list might be something like 10 Secrets Of Hollywood Stars. A feature might be something like FreshBooks Is A Great Tool For Small Businesses. People like reading these posts because they get valuable information. You get secrets in the first one, which can be either useful or interesting. And in the second you get insight into a tool that might help you. Plus with featured posts you can often get the featured brand or individual to re-share your post. Now, you can take this a step further by combining the two (or by combining other types of posts). Minted does this often. Here is one example: Wedding Inspiration – 10 Creative Welcome Signs. Great work is featured by great artists. And it’s a list and people love lists. The images are great and so are the descriptions. I can see people loving this post and I can also see those that are featured sharing and re-sharing the post with their followers. It’s a win for everybody – Minted, those featured and readers. It’s really great to see a consumer-based company doing something great with a blog. It’s easier to see the value in blogging when you’re in the B2B world. Often, the client transactions are bigger so you don’t need as much traffic. But I can see the value in B2C companies blogging as well especially a company like Minted. They are helping their community to sell more and more goods. I think the folks behind the Minted Blog are doing a great job. There is tons of great content. I’m not the target demographic and I still found the posts useful. It’s a great example of a successful business blog.